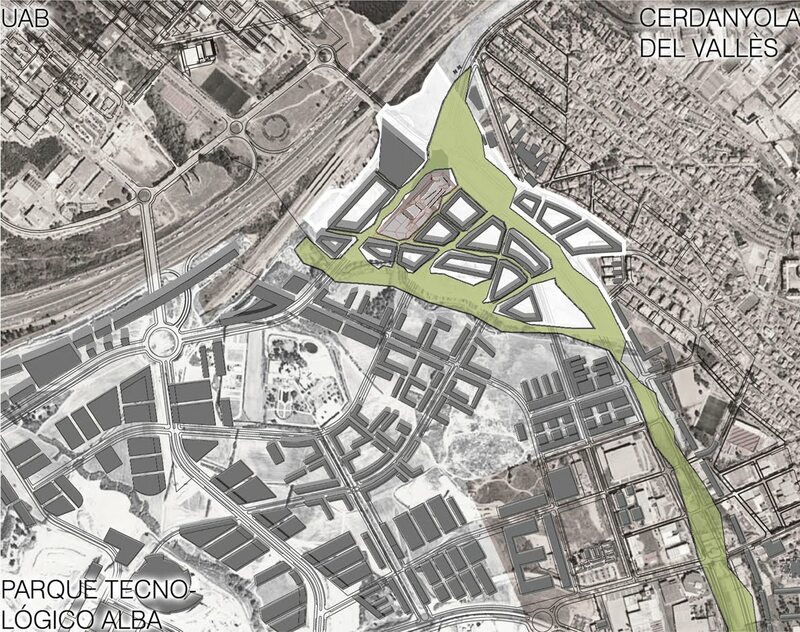 Today we present the Europan 2011, the first of this series of competitions we are currently posting. 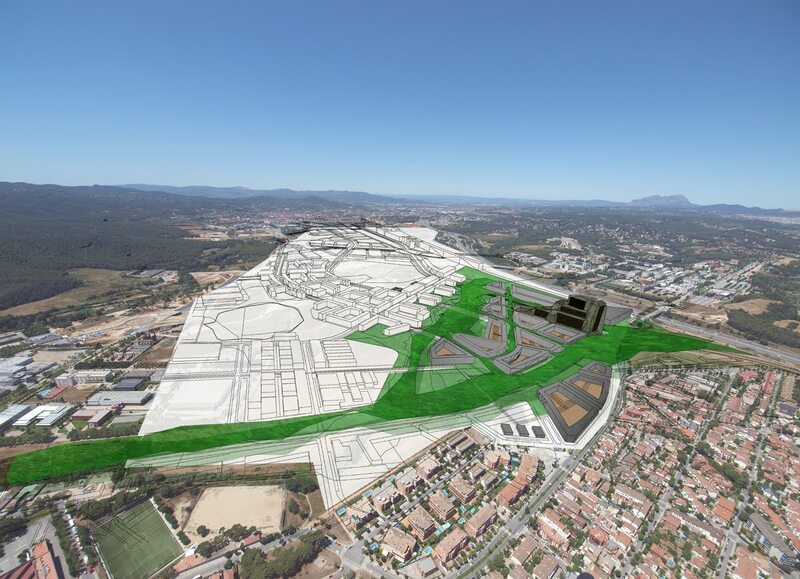 The development of a new neighbourhood with a new city proposal. 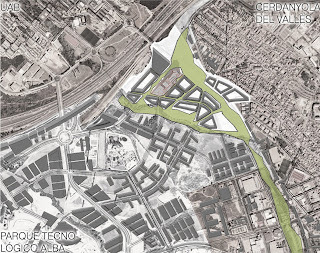 The site is next to a highway (blue) next to a green axis (green) and in contact with the new High Speed Train station and the biggest university campus in Barcelona. 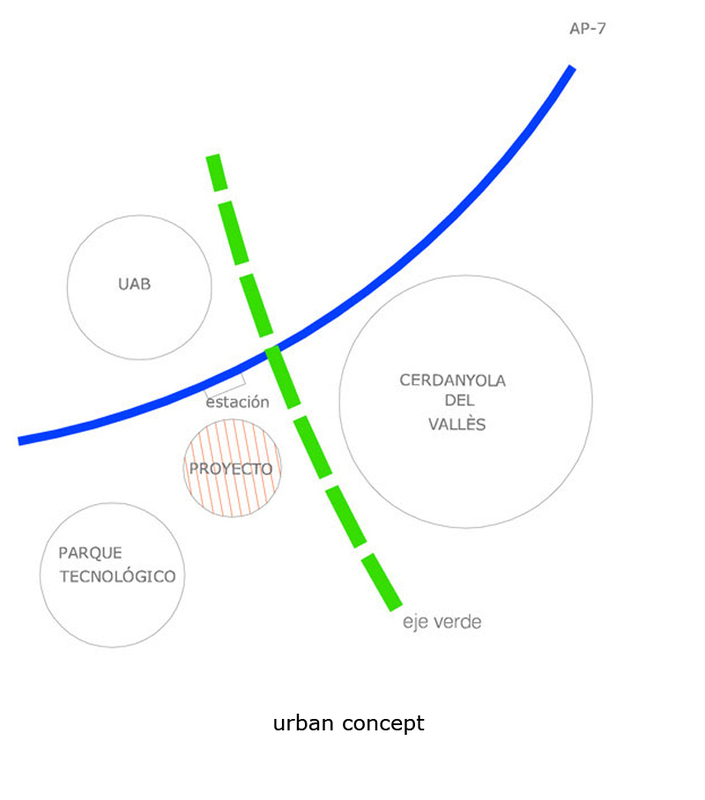 When we started to check the project we had very clear that we wanted some kind of recognizable city (Barcelona and it's green where the clear referent in this case), we wanted to create a green icon able to spot this new centrality point in the map, and we wanted a new use of the street that would suit a new and young neighbourhood. So we took the given plan, converted it into closed blocks to generate a clear public space, turned public space into a park moving the cars into the blocks and finally created a green icon that would articulate this new area. 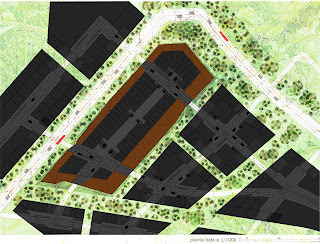 This is the plan of the new neighbourhood: you can see how the green axis doubles just before our site to follow and existing river and our neighbourhood becomes a park with the buildings on top of it, respecting the proposed force-lines but creating a new kind of private-public relationship. In the perspective view you can clearly see how the green icon becomes a "mountain" that recovers the relationship with Montserrat (further in the photo) and spots the new centrality point in this area. 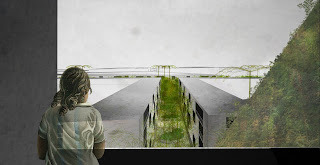 Another view showing how the "cliffs" become the housing areas. 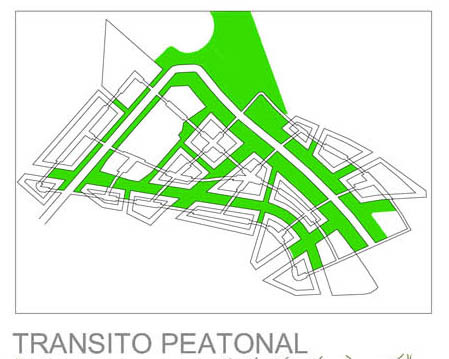 And the park system along the icon at several levels, whereas the green park extends following the green axis. Separating the cars from the pedestrians we created a friendly street, open to the use and safe for everybody. 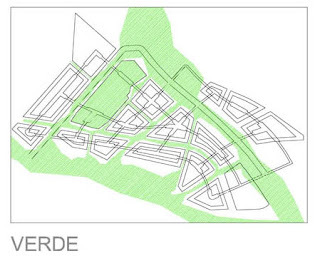 Plan of ground floor showing the park around the blocks, still as a street but understood as a green lung for the area. 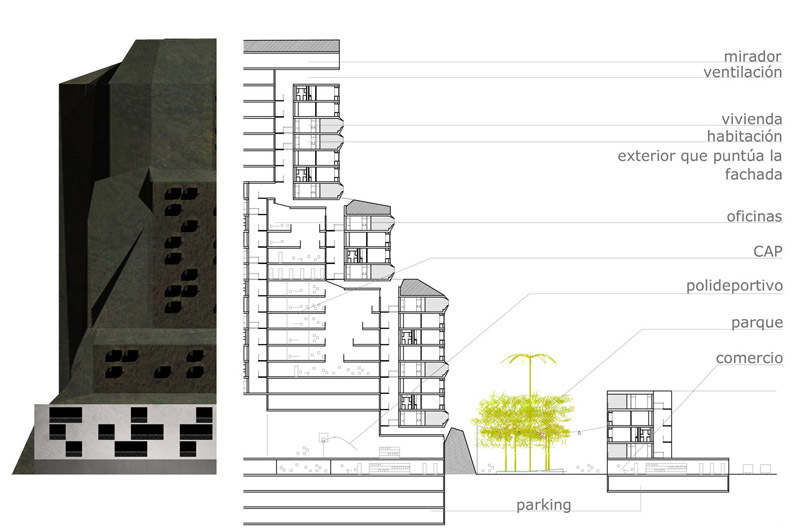 The ground floor becomes a tertiary space that will bring small commerce to the area, making it alive. 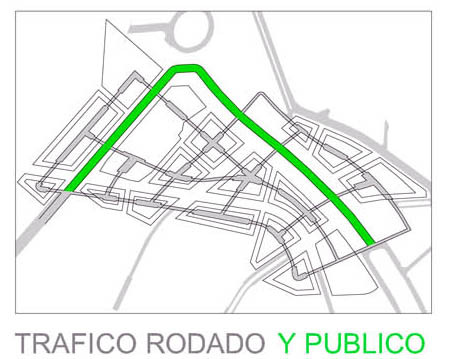 This separation of the cars generates a street (gray) with maximal pedestrian occupation and minimal contact with cars. 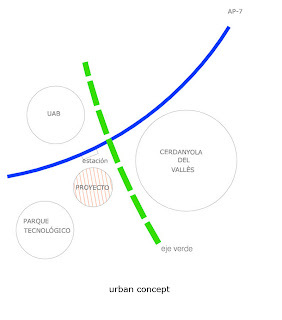 A view of the park system with the icon. 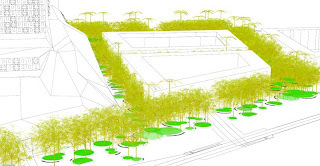 The trees group in series of 1, 3 or 5 (with a palm) to generate the street landscape. 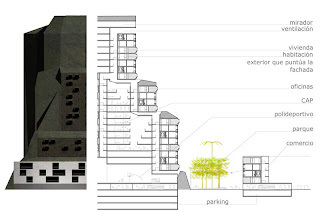 A view of the ground floor: an open street car-free as a lung of green, and the icon as the new centrality point of the area. 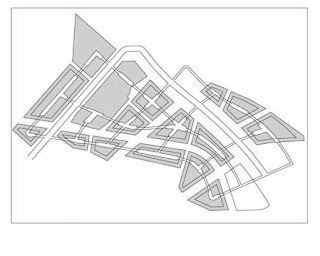 Public (in the park) and private (inside the blocks) car circulation. 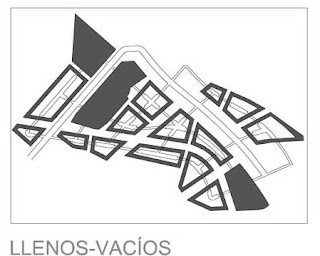 Services: the icon is filled with public spaces, becoming not only a "seen" icon but a "used" icon, reinforcing the idea of a neighbourhood where the citizen is the most important. Pedestrians walk through all the area in a mix of street and park system. The housing is a modular system based in a block, this block is cut in a diagonal system to create two spaces (night-day) and this "negative" spaces are then turned into an outside living space and the services area. To create the several typologies more modules are added inside this system. Giving a wide range of areas that will allow variability inside the block. 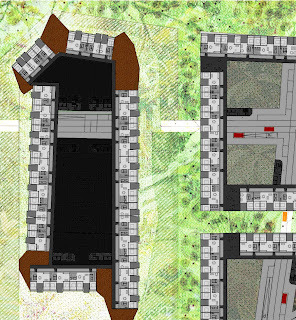 Working with modules also allows changes (in time) inside each typology: what was intended to be a typology for a couple with a kid, can become a flat for a single or a shared flat for 3 flatmates without changing the main areas. 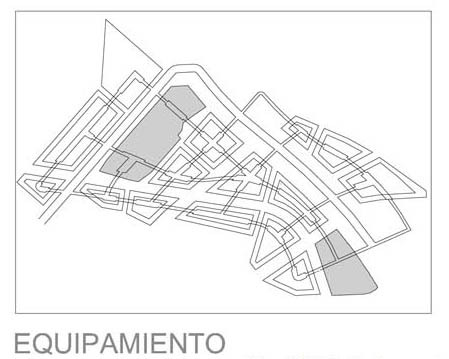 The services area is intended to be an open block but can easily make independent the wc and the kitchen. The open space is slightly changed in the icon and the block to create a more protected space (as the icon would go much higher). 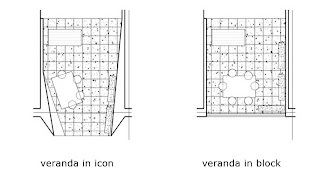 The typological variation in height will create a changing rhythm. 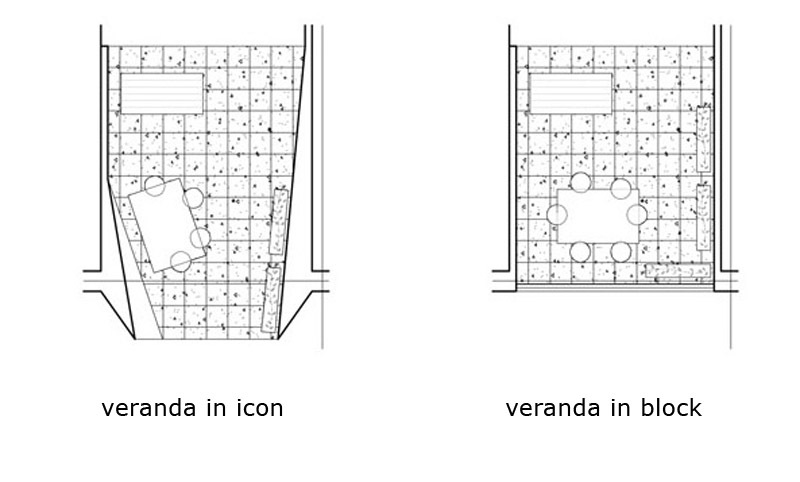 That will be visible from in the facade, giving variability inside a rhythm. Icon and block share a common housing typology but whereas the block only has space for the tertiary and the cars, in the icon all the inside area becomes a series of services for the community. 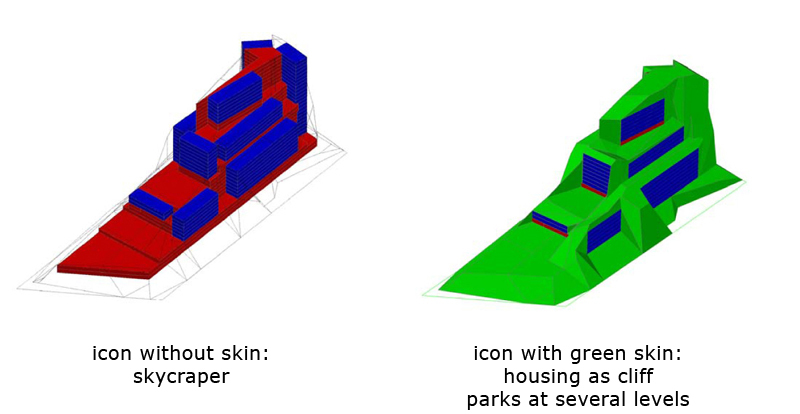 The icon uses his mass to generate a high park, like a mountain where the cliffs become the housing units and each of the platforms is accessed through the public realm. 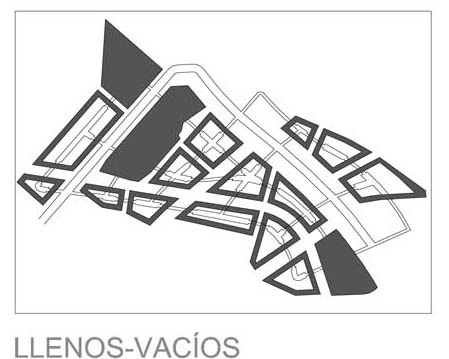 A new kind neighbourhood based in the contact with the exterior, where the citizen becomes the main character.